Dirk Gently's Holistic Detective Agency is a Netflix series inspired by the character created by Douglas Adams in the novels Dirk Gently's Holistic Detective Agency and The Long Dark Teatime of the Soul, and is not to be confused with the British series Dirk Gently, also based on the books, starring Stephen Mangan. The Netflix show relocates Dirk from London to the USA and alters his backstory somewhat, though at least they didn't turn him into an American. It stars Samuel Barnett as Dirk and Elijah Wood as his assistant, Todd. If you're watching the series, what do you think of it so far? Dirk Gently's Holistic Detective Agency Poster. Netflix, via Wikipedia. Fair Use. 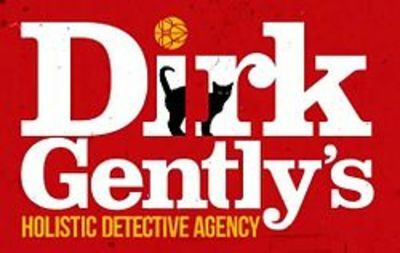 We've been talking about watching Dirk Gently, but we haven't started it yet. I assume it's good? I wasn't expecting to like it because I hate it when they relocate British shows to the US like that, but I found the mystery really intriguing and I like the characters. No, I hadn't heard of it, as we don't do Netflix, but I do watch every Inspector George Gently episode on iview that comes out! That's a different detective. Confusing with the names. no, dont have Netflix, but beginning to think I need it -cannot decide which one to get though.